Customer and Brand Protection - Inland Vacuum Industries, Inc.
Inland Vacuum Industries, Inc. is committed to providing our customers with quality, cost-effective products and services. As part of this commitment, we are actively working to combat counterfeit and imitation products. Counterfeit products could contain low quality ingredients that may not be up to spec, or they may be a completely different type of oil that could damage the user’s vacuum pump or system. Only genuine Inland Vacuum products carry with them our guarantee that the product meets or exceeds the specifications outlined in our documentation and website. In this picture, the bottle on the left is counterfeit while the bottle on the right is genuine. Note the difference in layout and fonts of the two bottles. Also note that the counterfeit bottle is branded “Inland Vacuum International, Inc.” and refers to “www.inlandvacuum.com.cn” and “info@inlandvacuum.com.cn” for the website and contact email address. These are not part of the Inland Vacuum company or brand. 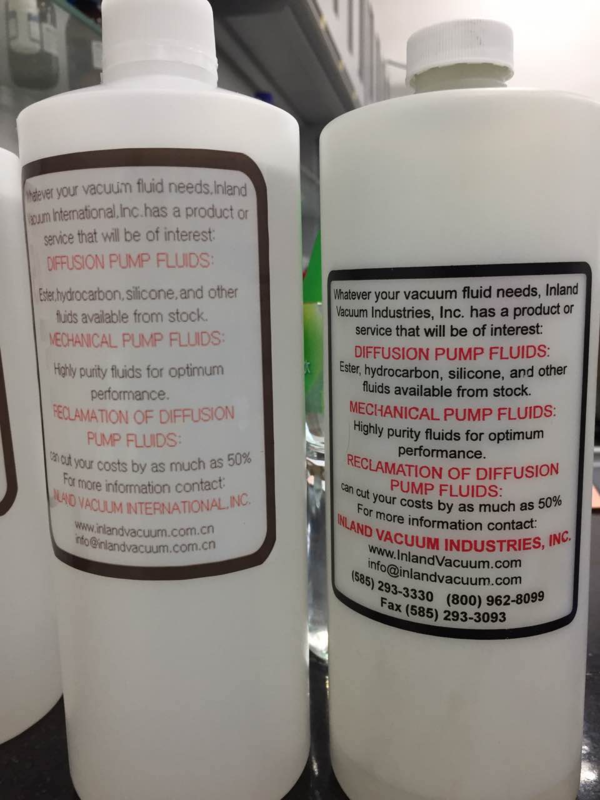 On the genuine Inland Vacuum bottle, the company name is “Inland Vacuum Industries, Inc.” it and has the correct website, email address, phone numbers, and fax number. This is just one example of what a counterfeit product may look like. There may be counterfeit Inland Vacuum products that have packaging similar or even identical to that of a genuine Inland Vacuum product. We encourage you to purchase from us directly or from your trusted source; this way, you can be 100% sure that you are getting a genuine quality product. If you have any suspicion about the origin of the product that you have, please contact us for verification.